At their healthiest as a band, the New Jersey-via-Philly quartet have made one of the best classic-rock records of the 21st century. But will it give them the push that they need? Standing in the middle of the crowd for Philadelphia DIY maestro Alex G’s show at Brooklyn venue Baby’s All Right, Joseph D’Agostino has a request. More of a demand, actually, as he shouts loudly and repeatedly for “Adam,” a 2013 ballad of G’s. His wry smile — half mischievous younger brother, half sassy aunt — betrays his lack of seriousness. But the sweltering heat at Baby’s has broken down pretenses, and the 27-year-old D’Agostino, still jacket-clad for fear of revealing the tightness of his leopard-print shirt underneath, isn’t letting up. “NO, JOE!” “SHUT THE F**K UP, JOE! !” Alex and his band shout over-dramatically, returning fire to their real-life friend. The quartet on stage played a number of dates opening for D’Agostino’s band, New Jersey indie panoramists Cymbals Eat Guitars, back in 2014, and since the frontman moved to Philly earlier this year, they’re now unofficial neighbors of his as well. Despite their protestations, the band does launch into “Adam” shortly after, much to their heckler’s delight. 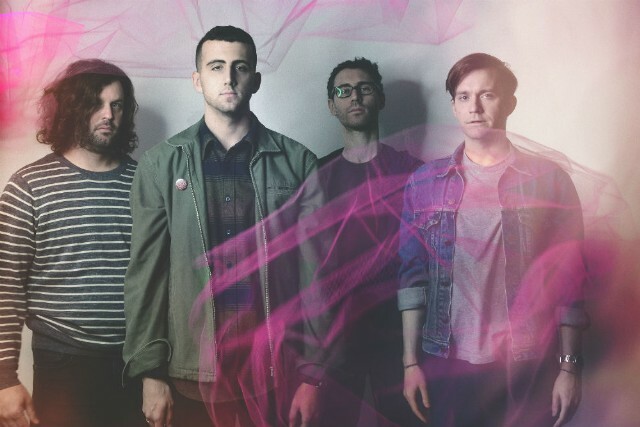 When we last heard from Cymbals Eat Guitars, in 2014, such affirmation was in fairly short supply for the Tri-State Area’s most irreproachable suburbs-shredders. At that point, the quartet was still trying to recapture the buzz they garnered a half-decade earlier with their rousing 2009 indie-prog debut, Why There Are Mountains, which earned rave reviews and got the band a supporting slot with legendary alt-rock freaks the Flaming Lips. That hype largely bled out with the more insular psychedelia of their 2011 follow-up, Lenses Alien, resulting in the band going from sold-out shows supporting Mountains to entertaining mostly empty venues for Lenses. Meanwhile, half the group left in between the two albums, with keyboardist Dan Baer and bassist Neil Berenholz replaced by Brian Hamilton and Whipple; after Lenses, longtime drummer Matthew Miller also left, his spot ultimately going to Andrew Dole. Circumstances got tough enough that D’Agostino enrolled in cosmetology school as a backup plan. “It was very much not suited for me,” the frontman says of his abortive second career. “And I was in an extremely dark place, looking back to the past to see what had happened, and looking for inspiration.” The album that resulted from this bleak period, ‘14’s LOSE, paired brutally personal lyrics — inspired by D’Agostino’s quarter-life malaise, and memories of the 2007 death of his teenage friend, Benjamin High, from a heart-related condition — with stadium-ready sonics, and more electrifying riffs and caps-locked choruses than the first two LPs combined. Critics were suitably impressed, and LOSE’s highlights — including the soaring climax “Chambers,” which recently passed one million plays on Spotify — became some of the band’s most popular songs. But the record still failed to replicate the push forward they’d been given by Mountains. “We did some amazing tours,” D’Agostino remembers of that bittersweet time. “We toured with the f**king legendary Bob Mould for the second time, which is a huge co-sign. And then on that same tour we played with Brand New for three weeks, which was a crazy-unbelievable live show. Somehow Alex G opened for us, you know? Everything that we did [to support LOSE] was really great. But the general level of, uh… how would you put it?” He turns to Whipple to finish his thought. “It didn’t sell?” Whipple offers. “It didn’t sell,” D’Agostino concurs. The group cites a number of explanations for LOSE apparently moving about one-fifth of the copies that Mountains has, including declining CD sales across the industry, and are careful not to sound ungrateful for the opportunities provided by the level of success the album did have. “Basically, the reaction to LOSE was really good, and we knew that it was really good,” Whipple attests. But was it as good as you hoped it would be? The resulting album — recorded in Dallas over a brief eight-day jaunt with modern-rock magic-maker John Congleton behind the boards (previous credits include St. Vincent, War on Drugs, and Cloud Nothings) — is easily the group’s most fun full-length yet. Years’ tone is clearly set by advance single “4th of July”: Not just because its shock-to-the-system urgency reverberates throughout Pretty Years, but because for the most part, the album’s 41 minutes make for a goddamn great cookout record. The guitars in majestic opener “Finally” shoot off like streamers, the skronking sax on the E-Street strut of “Wish” sizzles like a plate of fresh-off-the-grill hot dogs, and the singalong ending to swaying closer “Shrine” fades out slowly like a setting sun. It’s an LP that demands a summer holiday to be properly appreciated. “For the Rising tour?” interrupts Whipple. Though Pretty Years bears the strongest classic-rock thumbprint of any Cymbals album to date — and it’s certainly strong enough to stand alongside the canonized records it looks to for inspiration — the band and Congleton were careful to keep their arrangements weird enough to prevent anyone from potentially mixing it up with a Foghat LP. The jaw-droppingly discordant sax on the 105.7 The Hawk-ready “Wish” is the most exhilarating example, but Hamilton’s pulsing keyboards and Dole’s motorik drums also push “Close” into near-krautrock territory, while D’Agostino’s Pixies-inspired howling over the thrashing punk of “Beam” is chilling enough to freeze a case of Yuenglings. “When we did do a really big classic-rock gesture it had to be just right and just f**ked-up enough, and f**ked-with enough,” the frontman explains. Browne’s importance can be felt all throughout Pretty Years. “Close” was inspired by a connection the couple forged during a mutual acid trip, and though D’Agostino started writing “Have a Heart,” the record’s most traditional love song, before their relationship began, he still swears it’s about her. Judging from the leap-of-faith vulnerability of the lyrics (“Can’t believe the s**t that we were promised / Really might exist”), it’s not hard to believe him. But at the very least, D’Agostino & Co. are trying. Even the most despairing cuts on Pretty Years can see the light at the end of the Holland Tunnel, as best exemplified by the penultimate track, “WELL,” whose heartland-rock chug and Born in the U.S.A. keys up the ante for the War on Drugs’ next album. “Think I need help / Wanna get well,” D’Agostino confesses on the chorus, evolving into the Joey Ramone-esque plea of “Wanna be well” by the song’s end. It’s a testament to the struggle for satisfaction that he hasn’t yet won, but whose halfway point he’s likely passed.